If most of us thought that organic container gardening is not possible in Manila and that farming our daily table meal vegetables can only be done in large farming lots, in provinces like Cavite, Bulacan, Baguio, Laguna, Rizal and the like, you could be wrong. Our family has just proven that there are options, alternative to farming vegetables in Metro Manila the organic way – healthy and safe to eat. That we can actually grown any type of vegetable anywhere we want and anytime. My dad is a garden geek and my mom loves plants and the art of growing vegetables with a challenge. Here’s what they did. Is Container Gardening Possible in Manila? Yes, today, both of them has just proven that even in your very garden whether what you have is a small space or a bit big space, it doesn’t really matter. You can actually grow and farm vegetables like tomato and pechay that is safe to eat, cleaner, organic, more nutritious and health-giving. Our family does this with the use of a system called “container gardening“. It is done in the very backyard of our home in Caloocan City. See the photo of our small container garden? That’s what we have right now in our backyard. How we did it is another story. Take note that we didn’t use kind of fertilizer to grow those greens in a container gardening set-up. 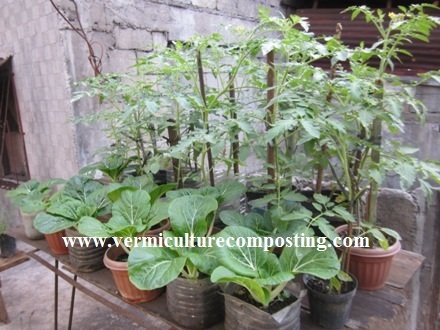 (we will show you how we do recycling ideas in our next posts for our planting containers) In the meantime, in the picture above is where you can see used and old pots we took from the Cavite General Trias house to plant our tomato and pechay vegetables. We put to use what most of us thought were useless scraps common to most homes and applied basic self-sustainability skills to our throw-away mineral water 4-liter containers to put them to use for our container gardening set-up. My dad cut the funnel-shaped top portion of the mineral water plastic bottle and used the lower end to plant the tomatoes and pechay. We tried not to use any kind of fertilizer to test it out if it is indeed possible to grow these kinds of vegetables in the backyard garden setup without so much money to spend. In the setup in the picture above is where you can see that all we used is labor of love to be able to grow those healthy looking plants plus a small initial capital (if you want it to become a small family business) of not more than Php 10.00. We have a breakdown of how much it costs to put up a small vegetable farming set up in your garden or backyard. Please take note that from the set up we made for our container garden, our family was only able to spend – Php 10.00 and that is only to buy pechay seeds which is not readily available. Next time, we are planning to buy high yield quality tomato seeds from agricultural supplies or best, from Bureau of Plant Industry in Manila. Just to show you that you don’t have to spend money to have the planting containers, there are other options unlike what we did which are readily available from our neighbors (the 4-liter mineral water plastic bottles and our used pots from Cavite), you can use big cans from kitchen cooking materials like the fruit cocktail cans or milk cans. Otherwise, you can always ask from neighbors if they have available plastic containers or anything you think you can use to plant the size of pechays or tomatoes or any veggie you want to plant in a container. All you have to make sure and consider is that they will fit in. The old wood from the demolished house were used to act as table for our vegetable containers. This is because we already have a set aside table skeleton that has no top. We piled up the old floor woods from the demolished house to come up with a decent and long lasting table to place the tomatoes and pechays we planted. Next time, we are increasing it up a notch with our system but still following the basic principles of organic container gardening system. We’ll be posting updates on this as well as how we did the trick with coming up with a plant container out of the 4-liter plastic mineral bottles. Expect that we will also be increasing our investment the next time so costs will definitely increase too for our system. We’ll also be experimenting on using 100% pure vermicast which we happen to sell here at Vermiculture and Composting blog. Lots of agriculture experiments soon to reveal so be sure to secure your slot by subscribing to our updates via feeds.